For the second day of Traditional dishes, I always look towards Athamma to teach me the dishes she is well known for. The way she makes the regular dal/ Pappu is very different from how Amma makes. Though I have always loved the way Amma makes, I can never say no to the way Athamma makes. And this has been a constant topic to debate between hubby dear and me if I have actually learnt to make dal as how she makes. While I agree that I can’t compete for her excellence I was insisting that I have got it right. 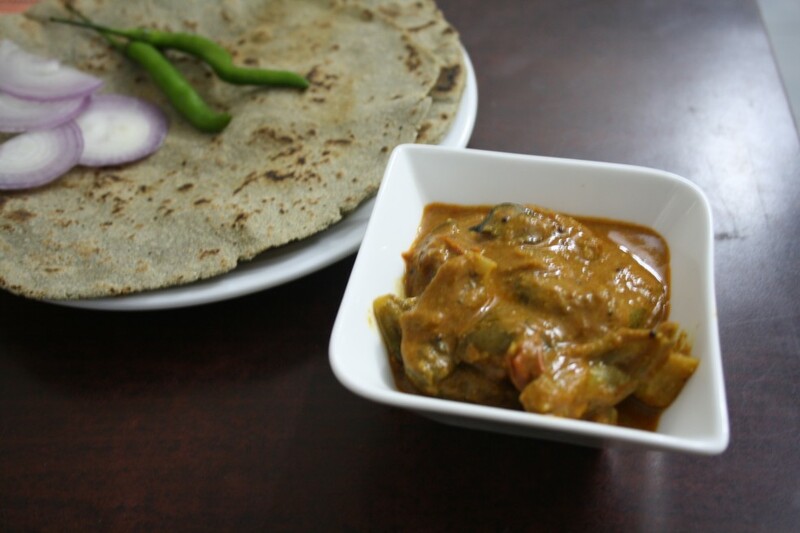 Coming to this recipe for today, this is a simple gravy made with brinjals as a side dish for Jonna Rotti. Athamma’s mom used to make this for them when they were kids and she continued to make it later as well. I think there is a strong liking with Brinjal and Andhra folks. They love their brinjal. Like Dad would love anything Brinjal. I am not that fond of these, however I prefer Gutti Vankaya over any dish any time. I am told that her mom used to make even bigger rottis, and would serve them immediately as they were a big family. When she starts cooking, kids used to sit around and get served right away and there is no special serving style or formal seating. With five brothers, cousins and others, her mom had cooking going on large scale. When she was telling me that, I was wondering how she must have judged how much gravy she has to make. With nuclear family as the trend, we hardly find it an issue, just imagine if one has to cook for 10 ppl on daily basis, all three meals. I might actually go crazy! I came to know from Athamma that Peddu asked when we will get Mangoes this season. Though the market is overflowing with mangoes, we still don’t have the sweet ones I guess. Only after the first shower of summer, will the mangoes turn sweet. Anyway I couldn’t keep away, hearing he wanted and got some. We were so disappointed that they were hardly sweet, some were sour as well. At least I was treated with their happiness brimming over, seeing the Mangoes. Wash and cut into long pieces, soak in water until usage. Heat a non stick pan with oil, temper with mustard, urad dal, curry leaves. Then add garlic, onions, saute well. When the onions turn colour, add finely chopped tomatoes and simmer. Now add salt and turmeric powder for the tomatoes to get mushy. Once it turns soft, add drained brinjal pieces. and saute well. Add chili powder, coriander powder and simmer with lid covered for 10 mins till the brinjal turn soft. Now add water and bring to boil. Finally add peanut powder and bring to boil. 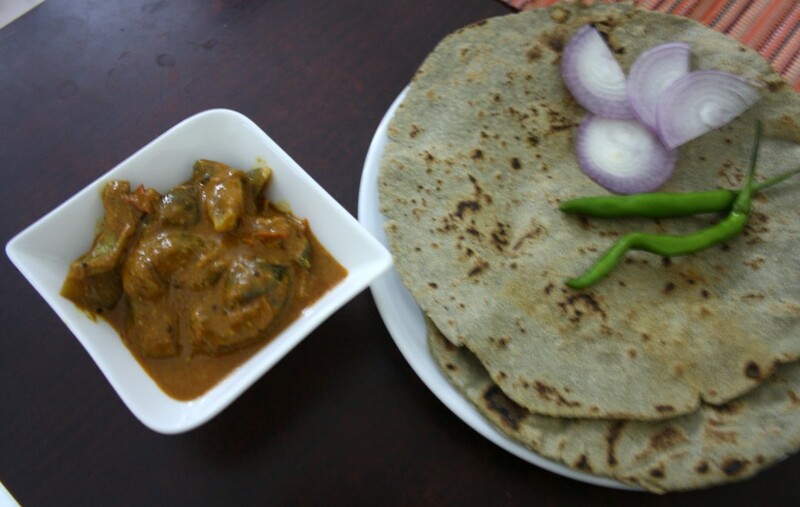 Garnish with coriander leaves and serve with rice, roti. Love brinjal and peanuts together in anything, obvious if its andhra curry,i can die for. Looks super good… gonna try this week..
Valli when people live in big famiilies they naturally learn to cook on large scale..well it is no big deal!..if you are used to:))..and I like the spices used in that gravy. I know we Andhraiites LOVE our brinjal. My absolute favorite vankaya in any shape or form. This curry sounds delicious, slightly different from what we make, will definitely give this a try. Brinjal lovers will have a feast!! 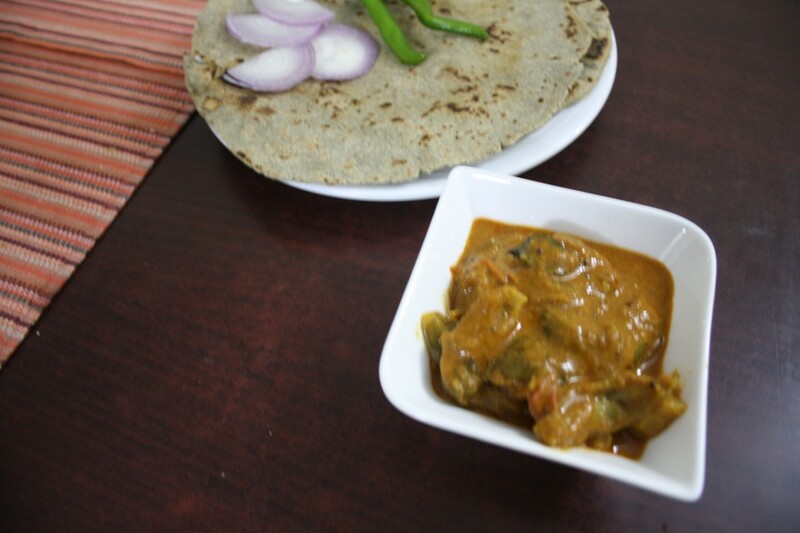 brinjal and peanut good combo… that's a gud traditional dish…. Delicious. We make it a dry version of it more sans garlic. I thought it was peanuts that Andhra people are nuts over (like we have coconut in Kerala)! Good to know that brinjal is also a favorite.The combination sounds really good! brinjal and peanuts are a good combo!! i love to add peanuts while doing brinjal kootu!!! so yummy!! I tried this recipe and it came out very well. Thanks for the recipe!